For other uses, see Driver. In computing, a device driver (commonly referred to simply as a driver) is a computer program that operates or controls a particular type of device that is attached to a computer. 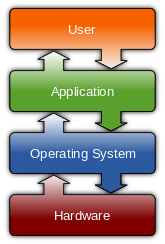 A driver provides a software interface to hardware devices, enabling operating systems and other computer programs to access hardware functions without needing to know precise details of the hardware being used. The main purpose of Device drivers is to provide abstraction by acting as translator between a hardware device and the applications or operating systems that use it. Programmers can write the higher-level application code independently of whatever specific hardware the end-user is using. The task of writing drivers thus usually falls to software engineers or computer engineers who work for hardware-development companies. This is because they have better information than most outsiders about the design of their hardware. Moreover, it was traditionally considered in the hardware manufacturer's interest to guarantee that their clients can use their hardware in an optimum way. Typically, the Logical Device Driver (LDD) is written by the operating system vendor, while the Physical Device Driver (PDD) is implemented by the device vendor. But in recent years non-vendors have written numerous device drivers, mainly for use with free and open source operating systems. In such cases, it is important that the hardware manufacturer provides information on how the device communicates. Although this information can instead be learned by reverse engineering, this is much more difficult with hardware than it is with software. Apple has an open-source framework for developing drivers on Mac OS X called the I/O Kit. Device drivers, particularly on modern Microsoft Windows platforms, can run in kernel-mode (Ring 0 on x86 CPUs) or in user-mode (Ring 3 on x86 CPUs). The primary benefit of running a driver in user mode is improved stability, since a poorly written user mode device driver cannot crash the system by overwriting kernel memory. On the other hand, user/kernel-mode transitions usually impose a considerable performance overhead, thereby prohibiting user-mode drivers for low latency and high throughput requirements. Virtual device drivers represent a particular variant of device drivers. They are used to emulate a hardware device, particularly in virtualization environments, for example when a DOS program is run on a Microsoft Windows computer or when a guest operating system is run on, for example, a Xen host. Instead of enabling the guest operating system to dialog with hardware, virtual device drivers take the opposite role and emulate a piece of hardware, so that the guest operating system and its drivers running inside a virtual machine can have the illusion of accessing real hardware. Attempts by the guest operating system to access the hardware are routed to the virtual device driver in the host operating system as e.g., function calls. The virtual device driver can also send simulated processor-level events like interrupts into the virtual machine. There are several variants of virtual device drivers, such as VxDs, VLMs, VDDs. 1 2 "What is a device driver?, The purpose of device drivers". PC Gesund. Archived from the original on October 21, 2014. Retrieved November 8, 2012. ↑ EMC Education Services (2010). Information Storage and Management: Storing, Managing, and Protecting Digital Information. John Wiley & Sons. ↑ Burke, Timothy (1995). Writing device drivers: tutorial and reference. Digital Press. ↑ "MAKEDEV — Linux Command — Unix Command". Linux.about.com. 2009-09-11. Retrieved 2009-09-17. ↑ "User-mode vs. Kernel-mode Drivers". Microsoft. 2003-03-01. Retrieved 2008-03-04. ↑ "Introduction to the User-Mode Driver Framework (UMDF)". Microsoft. 2006-10-10. Retrieved 2008-03-04. ↑ Deborah Morley (2009). Understanding Computers 2009: Today and Tomorrow. Cengage Learning. ↑ Computer Peripherals and Interfaces. Technical Publications Pune. Jan 2008. pp. 5–8. ISBN 8184314744. Retrieved 2016-05-03. ↑ "What are Device Drivers and why do we need them?". ↑ "CCISS". SourceForge. 2010. Retrieved 2010-08-11. Drivers for the HP (previously Compaq) Smart Array controllers which provide hardware RAID capability. ↑ Russell, Steve; et al. (2003-10-21). "Abbreviations and acronyms". Server Consolidation with the IBM eserver xSeries 440 and VMware ESX Serve. IBM International Technical Support Organization. p. 207. ISBN 0-7384-2684-9. Retrieved 2011-08-14. ↑ "US Patent 5969841 - Gigabaud link module with received power detect signal". PatentStorm LLC. Retrieved 2009-09-08. An improved Gigabaud Link Module (GLM) is provided for performing bi-directional data transfers between a host device and a serial transfer medium. ↑ "Unified Audio Model (Windows CE 5.0)". msdn.microsoft.com. Retrieved 2016-09-19. ↑ "dxd - dynax driver framework: Main Page". dxd.dynax.at. Retrieved 2016-09-19.